Whether your dream is to build your own house or you are a professional architect looking for quality 3D renderings for your architectural designs, we can provide the service you are looking for. Our 3D graphics experts can create beautiful images based on your sketches, CAD drawings, or simply on your own thoughts and ideas, which you would like to see turned into your ideal home. Using the most recent software applications, our graphic designers will provide realistic renderings that will let you visualise in 3D the finished building in its own location. Our professional, compelling designs can be used to support a planning application or serve as advertising material. 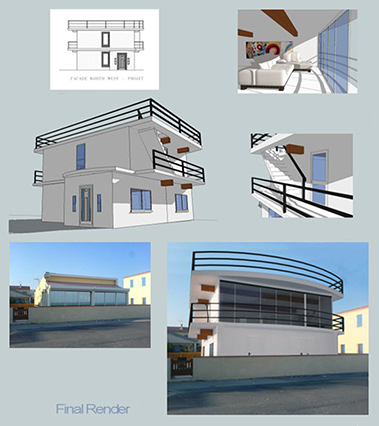 Don’t hesitate to contact us for a quote for your architectural design project. An example of our architectural 3D rendering service, showing a house with large windows, with the interior rooms and features visible through the windows and the setting sun reflected in one of the windows. The initial sketch of the property is also shown. 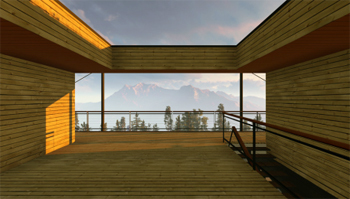 Using CAD software, the beautiful mountain view was created to give the feel of the actual location where this wooden property would be built, creating a stunning design that really captures the feel of what it would be like to live there. The spacial awareness we have with 3D rendering even helps us imagine where the furniture will go. Using 3D graphic rendering, we created this beautiful house with swimming pool and again showed interior features through the large windows. 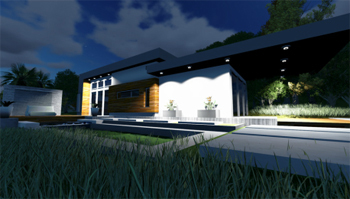 The outdoor lighting was a particularly important feature for this architectural design, therefore we created this CAD image to show the house lit from the outside during the night. 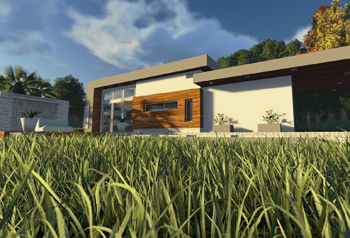 We provide realistic 3D CAD (Computer Aided Design) graphics of the house or property in the environment where it will be built, using lighting that will naturally occur before you've even laid the first brick! 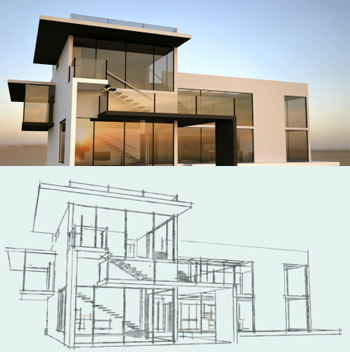 You can use our architectural design services at any stage in the process, whether you just have an idea of how your house should look or if you already have CAD graphics of your own.